Note from the editors: On Saturday October 24th citizens in Montenegro went out on the streets to prevent further degradation of the constitutional order and demand the formation of a Government of National Unity to organize the first free and fair elections in the country. This protest went on following violent dispersal of peaceful civic protests on Saturday, October 17 th, and subsequent police assaults. Civic protests of a non-partisan character followed on Sunday October 18 th. In the days leading up to the October 24th demonstration, a protest memorandum called for the protests to be civic in nature, peaceful and non-violent, in defense of the Constitution and Montenegro’s republican system, democratic, and in defense of human rights and civil liberties. 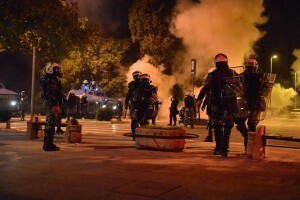 “Police in Montenegro’s capital Podgorica have fired teargas to disperse several thousand people who rallied demanding the resignation of prime minister Milo Đukanović, the third such clash in a week. Below we present the conclusions released by The Council for Civilian Oversight of the Police, in its 55th session held at the Assembly of Montenegro on 26 October 2015. This text, which concluded that in the three cases discussed, police officers, “grossly violated the personal dignity of these citizens,” is followed by a list of links to sites and articles featuring videos and photos and taken by civilians, which make it clear that the police took this opportunity to act with brutal force. The very last link features very graphic images and should be viewed with caution. The article accounts that among those injured were a 77 year old university professor hit by two rubber bullets, a 73 year old woman hit by two rubber bullets in the hand and leg, and a protester who was filming police actions and then was suddenly beaten by a group of masked/hooded men carrying sticks. A number of eyewitness accounts speak of police using tear-gas and shock-grenades against citizens who weren’t involved in any illegal actions, and there are three different accounts of police beating individuals who were sitting in cafes and weren’t even part of the protests. The article also includes eyewitness accounts of how the police used Hummers marked with the insignia of the Special Antiterrorist Units (SAJ) to charge into crowds of people demonstrating that day. The final photograph in the article concerns an individual who was hit by a SAJ hummer and then beaten by a number of officers. The Council for Civilian Oversight of the Police, in its 55th session held at the Assembly of Montenegro on 26 October 2015, on the basis of Article 112 of the Law on Internal Affairs, has reviewed the complaints it received concerning the application of police powers. On the 25th of October 2015, the Council at 12:44am was informed by the citizen Tea Gorjanc Prelević of her knowledge that near her building she saw and filmed a citizen who was laying motionless on the pavement before being approached by police officers. She also expressed concern about the health of this citizen, since at that moment, from her perspective, the citizen wasn’t showing any signs of life. The police officers present ordered her to enter her apartment. Later when the police had cleared out, the citizen was no longer to be found at that location. Attached with her report she included two photographs. In an additional communication, at 12:45am, the same citizen specified that her photos were taken exactly at 11:20pm. The members of the Council were immediately informed about the citizen’s message, and on the same day at 12:51am, the Council, through its President, notified the leadership of the Police Administration and the Ministry of the Interior, asking for information on the health and the identity of the citizen from the photographs provided. The Council, on 25 October 2015 at 2:00am, was able to establish contact through social media with the citizen in question, who requested anonymity (but whose identity is know to the Council), who provided photos of a demolished car, and provided a statement that a group of police officers allegedly brutally beat the driver of that vehicle and destroyed the car. The council published photos of the vehicle and called on citizens that had witnessed the event to contact the Council. After a few hours, the identity of the citizen was announced and several video recordings of the event were released that point to the police’s behaviour as well as photos of the citizen Milorad Martinović that confirmed his injuries. The information about this incident was also reported to the media. The Council subsequently received complaints from the NGO Citizens’ Alliance and a group of citizens that is acting under the name ‘Citizens,’ as well as reports by several citizens who noticed the police’s unprofessional conduct. All of them, and particularly the NGO ‘Citizens Alliance, provided video footage that indicates serious suspicion of the abuse of power and excessive use of force against a person, as alleged in the complaint, who isn’t a protester and the destruction of his private property. The Council, through its work on this case, carefully considered the available material. The Council, on the basis of the available documentation, concluded that there was a clear use of excessive force by law enforcement officers in this specific intervention. The Council concludes that the police officers acted unprofessionally towards citizen Milorad Martinović, overstepping their authority, and that he was also subjected to torture, inhuman and degrading treatment, during which he was severely injured and his vehicle destroyed. The council requests that the Police Administration identify all the police officers involved in this concrete case, who by their actions overstepped the bounds of lawful police conduct, as well as the basis for proceeding in this case and the relevant chain of command for this action. The Council, on the basis of its statutory powers, requests that the Police Administration release this information as soon as possible to the public, in order to preserve the overall credibility of the police force, particularly bearing in mind that this case has disturbed the public. The Council, in response to these complaints has concluded that there was an inappropriate use of force against the citizen Gojko Raičević who wasn’t resisting. The Council is demanding that the Police Administration reveal the identity of the acting police officer, as well as information tied to processing his conduct and to inform the public about this. The Council finds that the acting police officers, in this case and in this way, grossly violated the personal dignity of these citizens. The acting police officers used excessive force against these citizens who at the time of the officers actions weren’t offering any resistance. The Council expresses its concern about these actions and finds that it overstepped its power and inappropriately applied these powers, which indicates undignified policing and a serious violation of the ethical standards and integrity of the police. The Council requests that the Police Administration without further delay inform the public of the identity of all acting police officers, to hold them accountable, as well as to recognize the objective responsibility of the commanding officer. The Council will continue to work on other complaints and ion that basis it has requested information from the Police Administration and the Ministry of Internal Affairs. ***WARNING: EXTREMELY GRAPHIC. A compilation of photos by the Citizens’ Alliance of some of the evidence of police brutality and the wounds left on people’s bodies from rubber bullets, tear gas, and police truncheons: http://www.vijesti.me/vijesti/slucajevi-torture-zalijetanje-dzipom-suzavac-povrede-gumeni-meci-857591. *Compilation of injuries put together by the ‘Sloboda Trazi Ljude’ coordinating body for yesterday’s protests: https://www.facebook.com/media/set/?set=a.962242007182143.1073741832.946505742089103&type=3 (injuries are from rubber bullets and police truncheons). * Photos of Mijo Martinovic in the hospital: https://www.facebook.com/p.vremeplov/photos/pcb.549788878502457/549788755169136/?type=3&theater.